Buy your Mamma Mia! on Broadway tickets before you head to New York. You can easily buy your theatre tickets online, which saves you time and money. Mamma Mia! 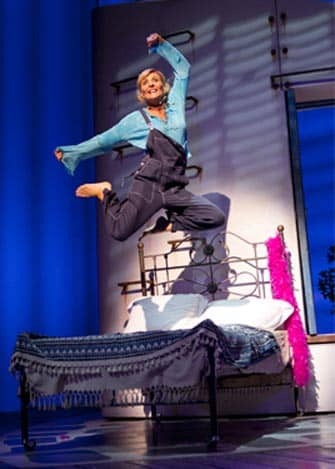 on Broadway is an incredible feel-good musical and perfect for a night out in the Broadhurst Theatre in New York. The story revolves around a feisty independent mother and a mischievous daughter. Oh and three possible dads. Yes three. Sophie is a young bride-to-be living on the Greek island of Kalokairi with her mother Donna. She has no idea who her father is and yet wishes for him to walk her down the aisle. After reading her mother’s diary – revealing three possible fathers – she decides to invite them to the wedding. She believed that she would know exactly who her father was the moment she saw him, but things don’t go exactly according to plan. The musical includes music from one of the world’s most famous bands: ABBA. Remember “Dancing Queen”? How about “Thank You for the Music”? I bet you still know how to groove to “Voulez Vous”! All these hits and more are in Mamma Mia! on Broadway, including of course the title song. This musical is unlike any other as it’ll have you on the tip of your seat ready to get up and dance along! Revisiting ABBA’s hits is not the only reason you should visit the show. The storyline is as exhilarating as the music itself. Fall in love with each and every character as they go through their own struggles and triumphs. Mamma Mia! is a tale of love, friendship but above all laughter. 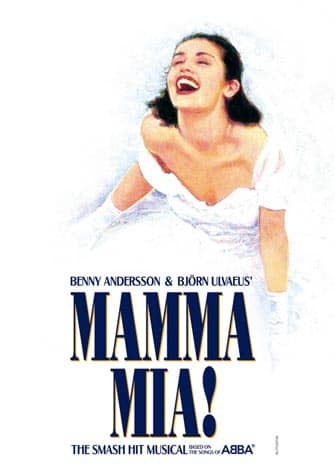 If you want to have a night out to remember, to feel a little nostalgic and perhaps even dance a bit, then Mamma Mia! is the show for you! How to buy Mamma Mia! on Broadway Tickets? 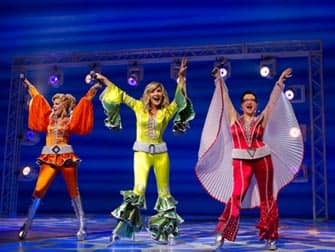 It is easy to buy tickets for Mamma Mia! with the link below. I recommend buying tickets online before your trip to New York. Why? The website below guarantees great seating in Orchestra or Front Mezzanine for discounted prices. You will save time and money and most importantly you don’t have to stress about finding tickets when you are in New York. A lot of Broadway musicals are very popular and are often sold out. If you are not fussed about premium seating and would rather be able to decide where to sit beforehand, then I recommend to book your tickets through this website. There is no service fee and free shipping (on e-tickets) or you can pick up your Broadway tickets locally. The link below, however, offers the best seating for that price.